A supervisory special agent for the Maine Drug Enforcement Agency holds packets of heroin and drug paraphernalia seized during a drug raid in 2000. 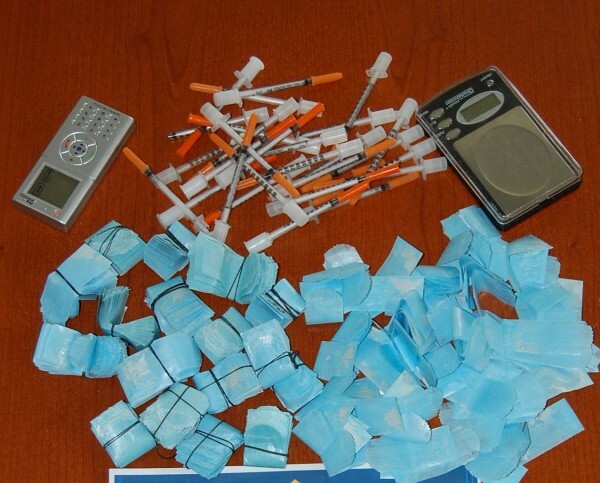 Heroin and needles photographed in 2011. Brunswick police Detective Rich Cutliffe said he’s “never seen anything like” the results of a preliminary screening test on heroin that officers allegedly found at the scene of a near-fatal overdose in the Tontine Mall parking lot in July. When added to chemicals in the test kit, the heroin, which caused the woman to stop breathing — she was resuscitated by paramedics — turned from clear to green to black almost immediately, according to Cutliffe, who works with the Maine Drug Enforcement Agency’s Portland office. “It was either the purity that was so strong that caused her to almost die from an overdose, or it was mixed with something else,” Cutliffe said last Tuesday. A surge in heroin use throughout much of the state has the MDEA focusing in recent weeks on the drug as an “emerging trend” and working to combat it before the unpredictable substance takes hold. After a number of high-profile arrests this summer for trafficking in heroin, MDEA investigators suspect at least three recent deaths in Cumberland County resulted from overdoses of the drug, with additional nonlethal overdoses likely. “It does seem like heroin has come back in a pretty strong way,” Kevin Cashman, a supervisor with the MDEA’s Cumberland District Task Force and a Portland Police Department sergeant, said last Tuesday. Cashman confirmed at least three suspected heroin overdose deaths in the past three weeks in Cumberland County communities, “plus a couple that were brought back” by paramedics using Narcan, a prescription drug injected to reverse the effects of an opioid overdose. “My agents in Cumberland County have noticed in the past couple of months that we’ve either been seizing more heroin or are being made aware of suspected heroin overdoses — not necessarily fatal, because they bring quite a few of [overdose victims] back [to consciousness],” he said. Crandall, who oversees MDEA operations in Kennebec County and areas of Maine west and north of that county, said he also has noted suspected overdose deaths, likely from multiple drugs. Unless clear evidence of an overdose exists, such as the presence of a needle in the arm of the deceased, such deaths are not ruled to be overdoses until confirmed by toxicology tests and postmortem examinations. The MDEA’s Western District Task Force based in Lewiston also has noticed an increase in the supply of heroin, although it has responded to any calls involving overdose deaths, according to Matt Cashman, supervisor for that unit and Kevin Cashman’s brother. “Through our intelligence and our people on the street, we’re finding that the supply of heroin coming in — obviously from out of state — has increased,” Matt Cashman said. He referred to recent high-profile arrests of members of alleged heroin rings. In the past four months, at least four heroin operations have been targeted across the state, according to media reports. In June, a Westbrook man was arrested after police allegedly found nearly 3 ounces of heroin — with a street value of $10,000 — in his motel room, the Bangor Daily News reported. Weeks later, the MDEA York County division charged three people from Brooklyn, N.Y., with aggravated trafficking in heroin and crack cocaine after seizing more than 11 grams of crack cocaine, 39.4 grams of heroin and several thousand dollars in cash. Also in July, the MDEA broke up a ring they said stretched from Rumford to Bethel, the Lewiston Sun Journal reported. More than 450 doses of heroin were seized, the paper reported, and authorities estimated the weekly stream of the drug at up to 4,700 bags of heroin. On Friday, MDEA agents charged two Milbridge men, both formerly of Puerto Rico, with trafficking heroin in Washington County after allegedly purchasing the drug and seizing more than 300 bags of heroin and more than 8 grams of bulk heroin, altogether valued at about $18,000, according to the BDN. Heroin use may be surging as opiate addicts attempt to find a replacement drug for oxycodone, which has become less available after a number of recent high-profile arrests that shut down what police say was a thriving business. “I think that’s a direct nexus to heroin coming back,” Kevin Cashman said. A change in the oxycodone drug formula to make it more tamper-resistant also may have prompted some users to switch to heroin, according to a Sagadahoc County drug investigator who declined to be named because he works undercover. Users preferred oxycodone to heroin, in part, he said, because “it’s like heroin, but you knew what you were getting” since the pills are manufactured according to a pharmaceutical formula and the exact dosage is marked on the pill. But a change in the formula causes the pill to turn to gel when it comes in contact with moisture — such as when an addict mixes it with water to inject it, he said. Maine residents often fly to Florida to visit pain clinics — sometimes known as “pill mills” — to obtain oxycodone, and then either mail the pills to themselves in Maine or bring them back in luggage. At a price of $1 per milligram, or $15 to $20 for a 15-milligram pill, “It’s such a lucrative business that you come back, sell them and you’ve got enough to further your addiction and still make money,” Cashman said. Whatever the reason oxycodone is less available, heroin seems to be filling the need of those with an opioid addiction, agents said. Most of the heroin appears to be coming to Maine from New York and Massachusetts, Kevin Cashman said. Cutliffe said he has seen drugs from Connecticut and Detroit. Not only is heroin more prevalent, and cheaper than oxycodone, but the drug on the streets of Maine is often far more potent, Kevin Cashman said. Where users previously would purchase a unit similar in size to a single-serving packet of sugar or artificial sweetener, now they often buy a “Dominican Tie,” Cashman said: 1/25th of the amount in such a packet, in a sandwich bag. Not knowing how potent the heroin is makes the drug much more dangerous, he said, as does not knowing with what it may have been cut — or diluted. And heroin, according to Matt Cashman, now “transcends all socioeconomic statuses. It’s no longer the drug that was taboo when you saw people in the hallways with needles in their arms,” he said. Heroin can be ingested, snorted, injected or smoked. 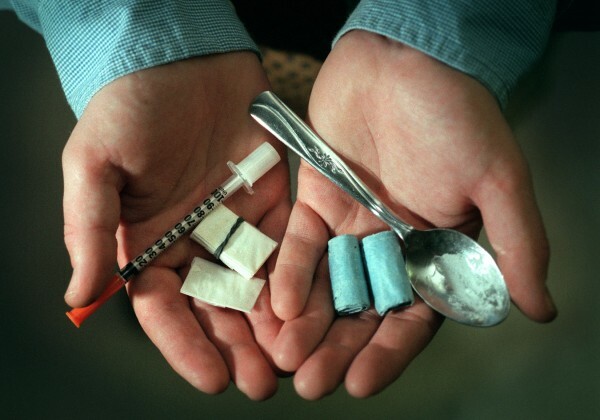 Some areas of the state have not seen an increase in the heroin trend. Jim Pease, supervisor and special agent for the MDEA in Lincoln, Sagadahoc, Knox and Waldo counties, said Monday that he hasn’t seen more heroin recently, and instead continues to focus on the synthetic drug known as bath salts. Cocaine remains the drug of choice in some areas of the state, and bath salts in others, such as the Rockland area. Prescription drugs are the major focus elsewhere, including parts of Sagadahoc County. In fact, in recent years, nearly 50 percent of the MDEA’s resources have been spent combating prescription drug-related investigations, Crandall said.